Narcotics Anonymous has universal recognition and respect as a stable program of recovery. Narcotics Anonymous is a global, community-based organization with a multi-lingual and multicultural membership. NA was founded in 1953, and our membership growth was minimal during our initial twenty years as an organization. Since the publication of our Basic Text in 1983, the number of members and meetings has increased dramatically. Today, NA members hold more than 58,000 meetings weekly in 131 countries and approximately 800 meetings in 15 areas in the Georgia Region. We offer recovery from the effects of addiction through working a twelve-step program, including regular attendance at group meetings. The group atmosphere provides help from peers and offers an ongoing support network for addicts who wish to pursue and maintain a drug-free lifestyle. 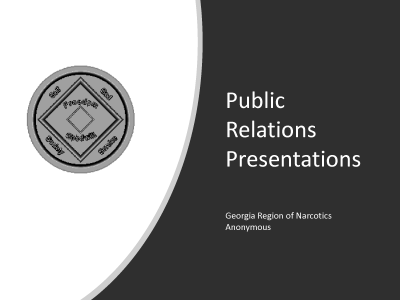 Our name, Narcotics Anonymous, is not meant to imply a focus on any particular drug; NA’s approach makes no distinction between drugs including alcohol. Membership is free, and we have no affiliation with any organizations outside of NA including governments, religions, law enforcement groups, or medical and psychiatric associations. Through all of our service efforts and our cooperation with others seeking to help addicts, we strive to reach a day when every addict in the world has an opportunity to experience our message of recovery in his or her own language and culture. Th relied-upon booklet, In Times of Illness was recently revised to reflect members’ experiences with challenges such as mental health issues, chronic illness and pain, and supporting members with illnesses. You can also find it in Spanish.